The Azusa Pacific University Bel Canto Women’s Choir, under the direction of David Hughes, DMA, presents more than 20 performances each year. With more than 40 years of service history, the 50-voice ensemble travels extensively, ministering to and entertaining thousands of people worldwide. In addition to U.S. appearances, the Bel Canto Women’s Choir has performed internationally in places as diverse as Romania, Poland, and South Africa in cooperation with APU’s Center for Student Action. Local destinations include annual appearances at the Disneyland Resort and the Peter and Masha Plotkin Memorial Art Gallery. On campus, Bel Canto enjoys ensemble partnerships with the APU Symphony, Symphonic Band, Oratorio Choir, Chamber Singers, University Choir, and Men’s Chorale. Annual participation in APU’s Dinner Rally, Celebrate Christmas, and student-led Liturgical Chapel help Bel Canto connect with students, staff, faculty and alumni. All Bel Canto students enjoy the opportunity to study voice with one of the department’s voice faculty. Bel Canto regularly features new works commissioned by APU faculty, students, and other recognized composers, and enjoys additional leadership by graduate assistant directors. 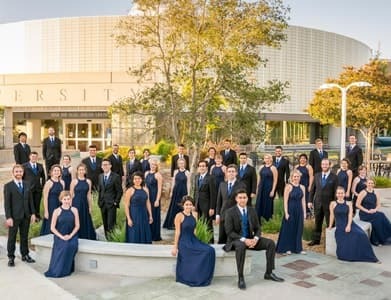 The Azusa Pacific University Chamber Singers, directed by Michelle Jensen, M.M., perform works in a variety of musical styles and periods ranging from early Renaissance to contemporary a capella. Founded in 2000, Chamber Singers’ high level of performance is a result of talent, discipline, excellent musicianship, and professionalism. Members of the ensemble strive to sharpen their skills as performers, educators, and musicians. 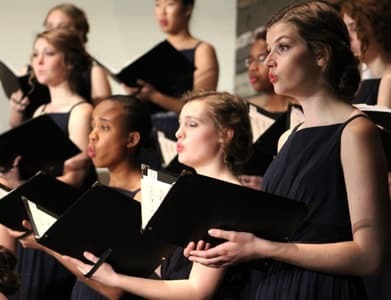 Chamber Singers perform at various university events and recitals, churches, high schools, other universities, and national and international conferences and competitions. In addition to hosting local concerts, the APU Chamber Singers have competed and toured in Germany, the Czech Republic, New Zealand, Australia, Italy, Wales, Ireland, and this year will be competing in France. They have performed at venues like the Sydney Opera House, the Vatican, Paul’s prison in Rome, and St Patrick’s Cathedral in Dublin. They have commissioned numerous works, including “This Marriage” by Eric Whitacre, and have collaborated with artists and composers including Morten Lauridsen, Eric Whitacre, Hila Plitman, Linda Eder, Sydney Guillaume, Ralph Carmichael, and Ben Bram (Pentatonix). 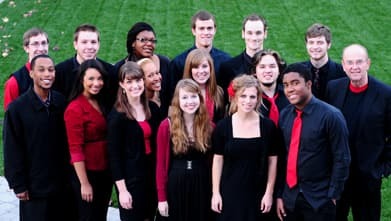 In fall 2011, the Chamber Singers were selected as 1 of 12 performing ensembles for the National Collegiate Choral Organization’s biannual conference in Fort Collins, Colorado, and again in fall of 2015 in Portland, Oregon. In spring 2013, the Chamber Singers went to Spittal an der Drau in Carinthia, Austria, where they competed in the 50th International Competition for Choirs (ICC) and won first place overall, and first place in every individual category by the highest margin in competition history. In spring 2015, Chamber Singers competed in the Llangollen International Musical Eisteddfod in Wales, where they placed second overall in the bid for the title of Choir of the World. Begun in fall 2017 under the direction and artistic vision of John Sutton, DMA, the APU Choral Scholars are the top undergraduate and graduate students in the School of Music. Founded to prepare students for professional careers as musicians, scholars, and performers, the Choral Scholars specialize in early music (Medieval, Renaissance, Baroque) and music of the late-20th and 21st centuries. Music emphases include music composition, choral conducting, music education, commercial music, piano performance, and church music and worship. 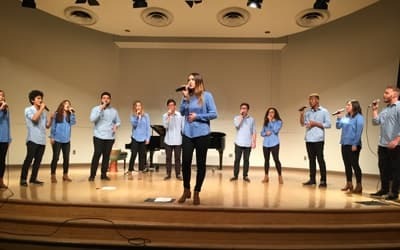 APU’s Gospel Choir combines unique voices with a fresh sound to establish a gospel music experience that is both artistic and cultural. Combining the gifts and talents of undergraduate and graduate students, faculty, staff, administration, and community members makes this choir one of the most diverse organizations on campus. The choir, led by Lavone Barnett-Seetal, M.A., performs at special events and at venues such as the Salvation Army, Union Rescue Mission, Desert Bar Association and Los Angeles Mayor Eric Garcetti’s Annual Prayer Breakfast. Future plans include studio-recording sessions for various artists, a local area mini-tour, which will include visits to middle and high schools as well as churches in and around the Los Angeles County. The Masterworks Chorale is a large SATB chorus performing major choral works with orchestra. 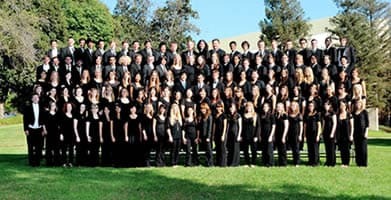 It is composed of APU undergraduate and graduate students, and is open to adult singers in the community via a choral audition with the conductor. The Masterworks Chorale is directed by John E. Simons, DMA, and rehearses 7-9:30 p.m. each Monday. For more information, contact the conductor at jesimons@apu.edu. APU Men’s Chorale, under the direction of Galen Clark, has been a respected choral ensemble in the School of Music for more than 45 years. Composed of men from all disciplines and majors offered at APU, this 80-voice ensemble performs regularly at churches, schools, and civic organizations. Their repertoire represents many musical styles, including traditional men’s choral music, spirituals, jazz arrangements, hymns, folk songs, and contemporary Christian music. Men’s Chorale regularly performs newly commissioned works by APU faculty and students and contemporary composers. 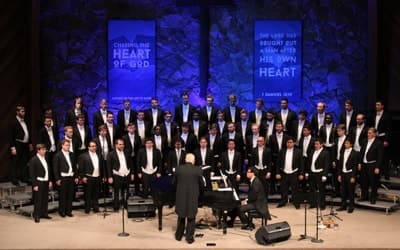 Men’s Chorale has appeared at the National Day of Prayer in Washington, DC, the Los Angeles Mayor’s Prayer Breakfast, and at A Celebration of Freedom at the Regan Library honoring 38 Medal of Honor awardees, as well as annual appearances for the Plotkin Memorial Foundation in Orange County. In addition, they have produced numerous custom recordings. Men’s Chorale tours annually, including the East Coast, Midwest, Hawaii, Korea, and Romania. In recent years, tours have included performances throughout the western United States. 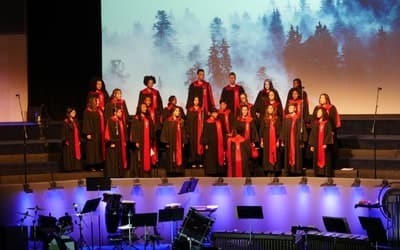 The University Choir, a premier choral ensemble in APU’s School of Music, is composed of top student musicians from the School of Music and throughout the university. Open to all students who read music and have choral experience, the University Choir performs the very best of choral literature from throughout the Western canon, specializing in music written for large choirs from historical periods and the latest compositions of today. This unique ensemble represents a diverse spectrum of students majoring in many areas of study who desire to minister to people through worship and music. Under the leadership of Galen Clark, Driven performs a wide variety of music ranging from Pentatonix songs to classic hymns, Renaissance to contemporary choruses, and gospel favorites. Their presentation includes riveting personal testimonies and profound messages. They perform regularly for community events throughout Los Angeles, and in various churches and Christian schools. APU’s East End Vocal Jazz is an audition-based vocal ensemble in the School of Music. The ensemble includes 8-12 talented singers and a full rhythm section. This ensemble performs a wide variety of vocal jazz literature, both classic and contemporary, and is available to perform for special private events in Los Angeles County. In addition to their performances each year, East End Vocal Jazz is honored to appear annually in the Battle of the Big Bands concert featuring both APU’s Jazz Ensemble and Citrus College’s Blue Note Orchestra. East End Vocal Jazz also appears regularly at schools, jazz festivals, civic organizations, and other local concert events. The ensemble is under the direction of Teryn McPherson, who also teaches as a Commercial Voice Private Instructor at APU, as well as Fullerton College. Teryn performs regularly with her own jazz ensembles such as the Teryn Ré Trio and Teryn Ré Big Band in the greater Los Angeles and Orange County areas. 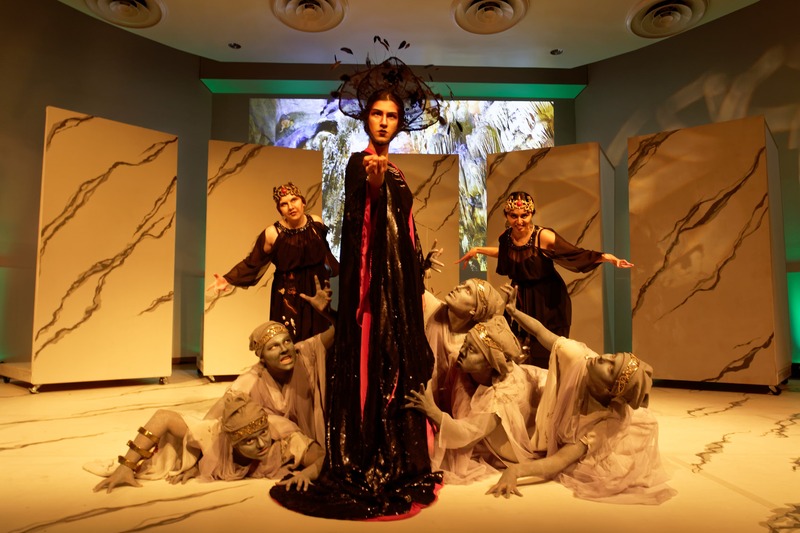 APU Opera offers comprehensive training for the aspiring singer/actor. Students work with designers from around the vibrant Los Angeles region, which is host to designers and artists of national and international renown. APU also frequently hosts master teachers and guest coaches from global industry-leading companies and conservatories. APU Opera offers excellent training within a supportive and encouraging environment where singers of all levels can grow and develop, reaching their fullest potential. Along with music and language coaching, students have opportunities for training in stagecraft, acting, makeup, and improvisation. The fall opera scenes and spring production give students ample performance opportunities in opera in addition to their other ensemble responsibilities in the APU School of Music. APU Opera is directed by Catherine Hackworth. 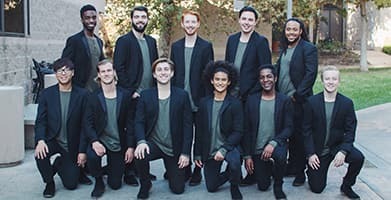 Undone, led by Galen Clark, is a ministry ensemble of 14 voices that reaches out to Christian and public high schools across Southern California, performing a wide range of music with beautiful testimonies woven between numbers. The name Undone comes from the fact that when we draw close to God, He draws close to us and His indescribable goodness and love leave us undone.